You can salvage your stale bread! Aside from making croutons, this is another great way to use it up…and it can be done very, very easily if you don’t have much time. Preheat oven to 325 degrees. 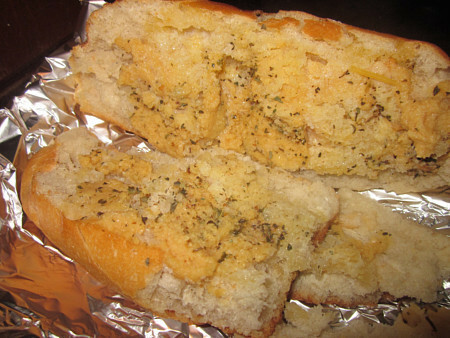 Cut the bread lengthwise and spread the butter on both sides, followed by the garlic and seasonings. Close the bread, wrap in foil and place on a baking sheet. Bake for about 15 minutes (depending on the size of the loaf). This entry was posted in bread, garlic, side dishes. Bookmark the permalink. 5 Responses to Don’t throw it away! I always have stale bread, this is a perfect idea Melissa!Have a great weekend! Can’t go wrong with garlic bread. Its a must have in this house! You can also make savory bread pudding with stale bread as well! ohhhh! great idea. i never know what to do with stale bread!